That’s how I would describe my rough drafts, and I’m probably being kind to myself there. Way back when Nichelle first popped into my head locked in that car trunk and proceeded to pester me to write her story, I tried to make an outline. It did not go well. It’s been a minute, but I clearly recall having her on a plane going to Florida to work on her story at one point in the outline. Writing along on the book, I thought: a crime reporter at a medium-market daily barely clearing a profit every six months is booking a last-minute flight to chase a story nobody really knows she’s working on? I know it’s fiction, but unless the story was set in the early 80s, that put it squarely in the fantasy category. Eight (wow, really?) books later, I’ve abandoned outlines for notes scribbled on my erasable whiteboard and virtual post-its in the margins of my Scrivener files. I open the computer, re-read what I have so far (or at least what I wrote yesterday) and put my fingers on the keys to see what comes next. My writer friends who outline always look aghast at this point in process conversations. They spend weeks making detailed chapter spreadsheets and covering their offices with charts and post-its, and I can tell my way makes them a bit squirmy. Fourth draft,​ and every flag there is something I found that needed correcting. What I’ve found is that writing a novel takes the same amount of energy no matter how you go about it. I write merrily along for about four months, and then need six weeks or so to clean up the rabbit trails in the manuscript, make sure it all makes sense and have a finished file ready to turn in. My friends with the monster outlines spend a month making a plan on the front end, 3-4 writing the draft, and a couple of weeks tidying it up before they send it to their editors. I try to remember their front end work when I’m ferreting out dead storylines for the 24th day in a row. 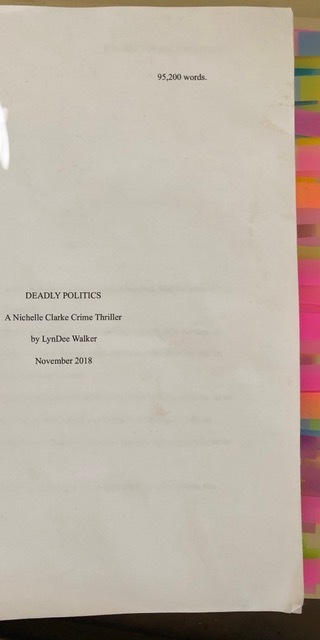 With the new Nichelle Clarke novel, DEADLY POLITICS, I actually made an outline after the fact, something I’ve never done before. There were a lot of intricate pieces in a short timeline on this book, and it was helpful to have the list to see how everything intersected and make sure it all come together right. I think that may be a useful new step in every manuscript from here on out, but my messy rough drafts are my comfort zone, and I’m pretty sure they’re here to stay.